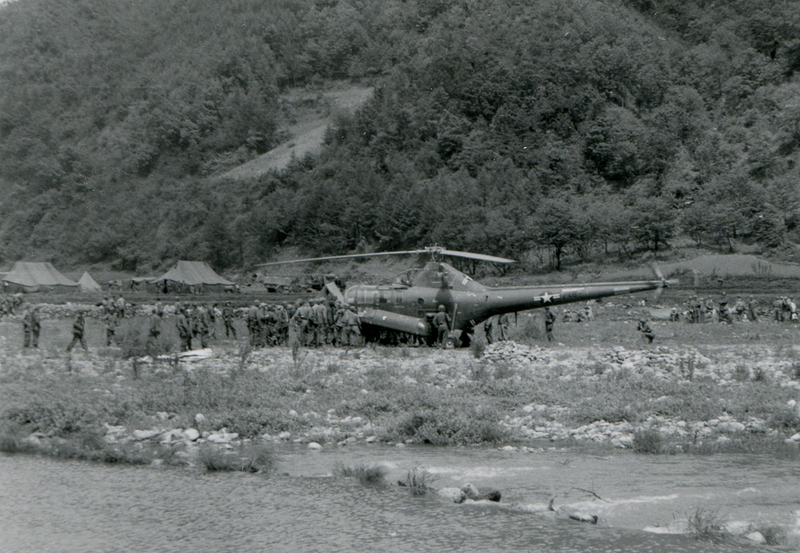 4 August 1950: During the Battle of the Pusan Perimeter, wounded soldiers were evacuated from the battlefield by helicopter for the first time when a Sikorsky H-5F of Detachment F, 3rd Emergency Rescue Squadron,¹ Air Rescue Service, United States Air Force, flew Private 1st Class Claude C. Crest, Jr., U.S. Army, from the Sengdang-ni area to an Army hospital. 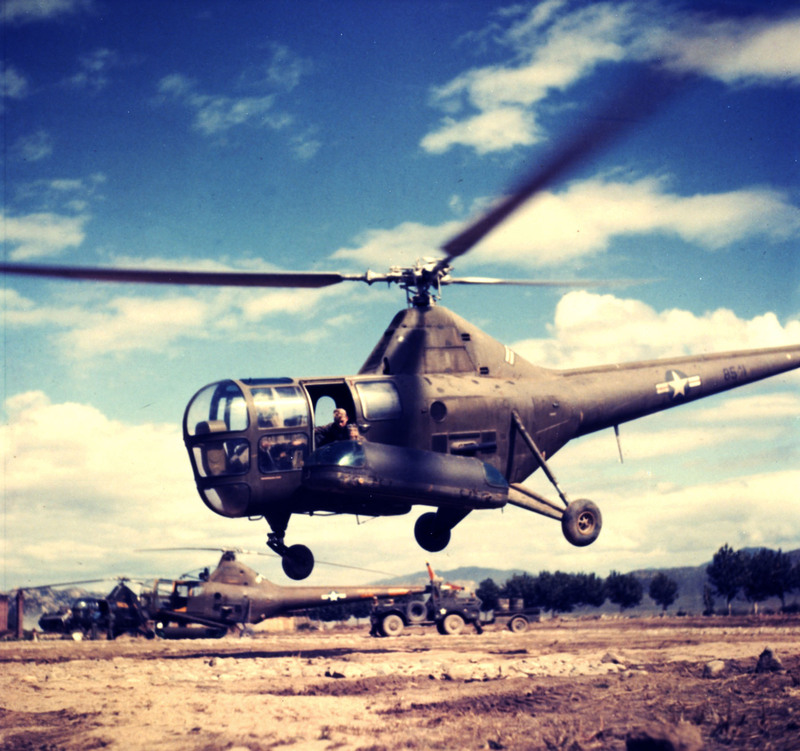 By the end of combat in 1953, 21,212 soldiers had been medevaced by helicopters. Only the second military helicopter, the H-5 was frequently flown overloaded and outside of its center of gravity limits. The helicopter was not armed, though the pilot normally carried an M1911 .45-caliber semi-automatic pistol, and the crewman, a .30-caliber M1 Carbine. The helicopter’s fuselage was 41 feet, 1¾ inches (12.541 meters) long. The main rotor had a diameter of 48 feet, 0 inches (14.630 meters) and the tail rotor diameter was 8 feet, 5 inches (2.565 meters),² giving the helicopter an overall length of 57 feet, ½ inch (17.386 meters) with rotors turning. It was 12 feet, 11–3/8 inches (3.947 meters) high. The tricycle landing gear had a wheel base of 10 feet, 1 inch (3.073 and the tread was 12 feet, 0 inches (3.658 meters). The S-51 had an empty weight of 4,050 pounds (1,837 kilograms) and maximum gross weight of 5,300 pounds (2,404 kilograms) below 1,000 feet (305 meters) MSL.³ Fuel capacity was 100 gallons (379 liters). 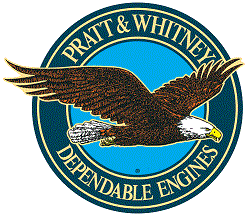 The H-5F was powered by an air-cooled, supercharged, 986.749-cubic-inch-displacement (16.170 liter) Pratt & Whitney R-985 AN-5 (Wasp Jr. T1B4 ) which was placed in the fuselage behind the crew compartment with the crankshaft vertical. The R-985-AN-5 was a direct-drive, nine-cylinder radial engine with a compression ratio of 6:1. It required 91-octane aviation gasoline and was rated at 450 horsepower at 2,300 r.p.m., Standard Day at Sea Level. The R-985 AN-5 was 48.00 inches (1.219 meters) long, 46.25 inches (1.175 meters) in diameter and weighed 684 pounds (310.3 kilograms) with a magnesium crankcase. The H-5F had a maximum speed (VNE) of 107 knots (123 miles per hour/198 kilometers per hour). Range was 275 miles (443 kilometers). The service ceiling was 14,800 feet (4,511 meters). The absolute hover ceiling was 3,000 feet (914 meters). ¹ Reorganized as the 3rd Air Rescue Squadron 10 August 1950. 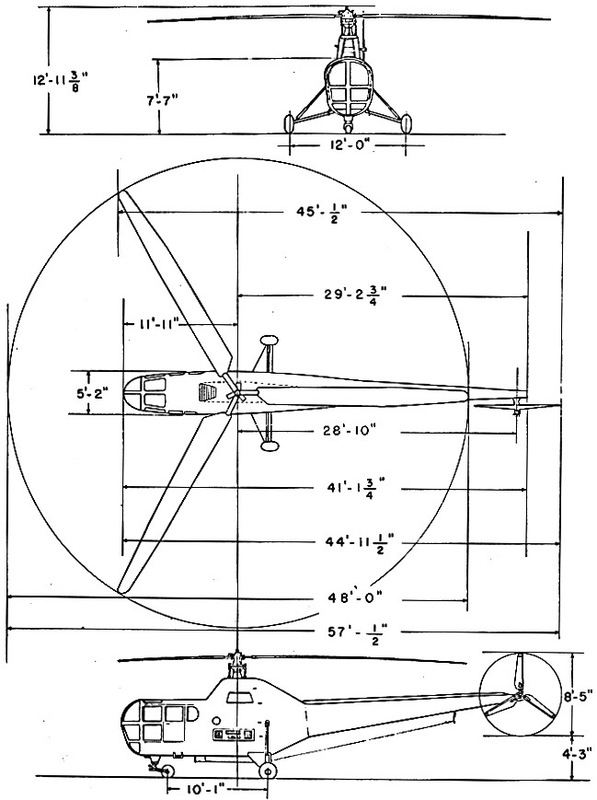 ² An 8 foot, 9 inch (2.667 meter) all-metal two-blade tail rotor assembly became standard with the H-5G, and was available to retrofit earlier helicopters. ³ The maximum gross weight had to be reduced 150 pounds (68 kilograms) for each additional 1,000 feet of altitude.